Yearning for some bona fide, traditional country? 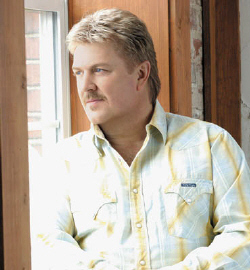 Look no further than Joe Diffie's new album, Tougher Than Nails. His first release for the Broken Bow Records label is certain to add more number one hits to the ten Diffie already has. When the vocals mesh with the instrumentals so perfectly, and the ambiance of the music is so real that you reach for a cold brew and some peanuts, you KNOW you are in honky-tonk heaven. Diffie's voice has always been mellow and easy to take. But time, or life, or both, has been good to him and the voice sounds better than ever. The up-tempo tunes are strong; the ballads possess a new vocal passion that wasn't as obvious on previous albums. No rough edges, just fluid, flawless, fantastic, from the heart music. The title song, despite its up-tempo rhythm, actually conveys a profound message. The "nails" referenced in the song are the ones that nailed Jesus to the cross. When you can relate a valuable life lesson from the Bible without being preachy ... well, this song gives a whole new meaning to "three chords and the truth." It seems like every really good album that I have reviewed lately has at least one song written or co-written by Billy Yates on it. This album is no exception. "Am I," written by Yates and Diffie, is classic country. I loved the vocal harmonies. Exceptional. "If I Could Only Bring You Back," is an intensely moving love song. It drops an anchor on your heart when you read the "cut by cut" and learn that it is the story of a child that was lost in an accident. That bit of knowledge takes this song to a whole 'nother emotional level. Powerful stuff. From first song to last, I really enjoyed this CD. Great balance between the heart-tuggers and the toe-tappers. You can hear the fun in the background chatter and verbal exchanges when George Jones, with whom Diffie shared a CMA Award in 1993, joins him on "What Would Waylon Do?" The humor continues on "The More You Drink The Better I Look " classic tongue-in-cheek Diffie. His singing and his songwriting are undeniably on par with some of the true icons in country music and this album proves he has what it takes as a producer. I think ten number one hits, seventeen top tens hits, two platinum and two gold albums is just the beginning. Tougher Than Nails just might prove to be a prophetic observation of Diffie's music career. This one's a keeper.